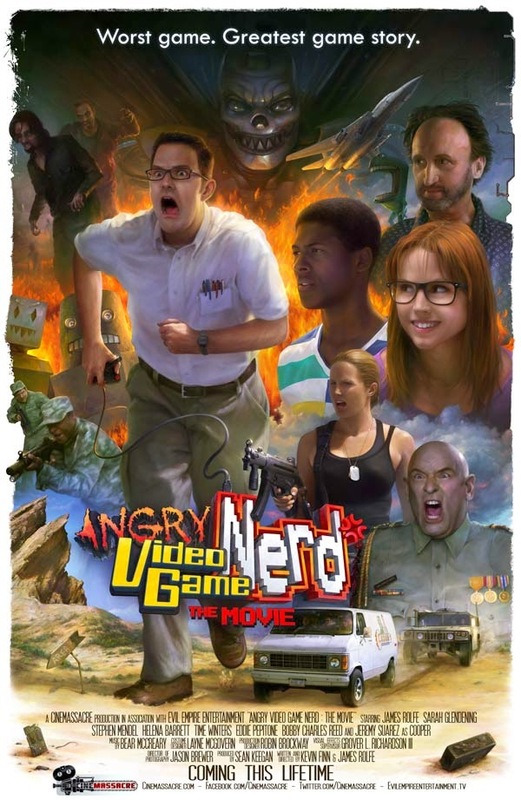 Well, I finally got around to watching the Angry Video Game Nerd movie recently. Now, I realize it's been out a little while. Anyone interested in it has probably already seen it. Anyone who's interested in a review has probably already read a more timely review from an actual reviewer. Still, if you're reading this and have not seen the movie, be warned that there will be spoilers. Only continue reading if you've already seen it or just really don't care. I approached the movie with high hopes, but low expectations. The plot revolves around the nerd putting off reviewing the notorious E.T. video game from the Atari 2600 console. Despite it being such a bane in his life, and his fans constant requests, he feels it's a game that simply needs to fade into obscurity. He attempts to "save" his fans by disproving the urban legend that the E.T. cartridges were crushed and buried in a desert in Nevada. In doing so, he and his friends get mixed up in the Roswell conspiracy. That setup actually isn't all that bad. Also, the presentation of the movie wasn't bad either. Most of the special effects are rather campy and cheesy-looking, but that actually works in the movie's favor. My issues come with the script. Many of the characters have very annoying and underdeveloped traits. The nerd himself, displaying very questionable logic, wants nothing to do with any women whatsoever. This is loosely explained as him not wanting romance to interfere with his nerdy lifestyle, but isn't very plausible and just comes off as awkward. In one part of the movie, the characters find themselves in a real-world video game reminiscent of Super Mario Bros., and later his friend Cooper can see the Nerd in his E.T. game as the Nerd walks through the real-world Area 51. Shortly after that, the same character controls the Roswell alien and breaks him out of captivity using his E.T. game, but immediately the alien is no longer controlled by Cooper. None of these events have any logic or explanation of how they occur, they just short of happen. A plot point about our entire universe just being a video game created by the alien character, in danger of being "turned off" by a second antagonist (more on that later) is mentioned so quickly and nonchalantly that I almost didn't even notice it. "You're entire universe is fake" is the kind of revelation that should really carry more weight to it. And about the antagonists, in addition to the military and government covering up the Roswell incident, a deity with the ability to destroy the universe is pretty much shoehorned into the story, and defeated with complete randomness. Seriously, Darth Vader turning into a scorpion has nothing on Death Mwauthzyx putting on groucho glasses and flying away. Finally, the acting. The female lead, played by Sara Glendening was really good. The Roswell scientist character, played by Time Winters, was also very well played. Aside from that, the performances fell flat. This includes the nerd himself. Overall, I'd give the movie a C-. I can see the appeal of it to those who like the "so bad it's good" kind of movies, but it just wasn't my cup of tea. Like I said, the setup was good, and the direction was good. I wish that the script was written by a better writer, and gone through many more drafts. I have a feeling this was made up as they went along and drafts were critiqued by a bunch of yes-men. AwesomeSauce Games Official Blog. Simple theme. Powered by Blogger.